Y’know when life happens? When you realise you’ve been paying your gas bill based solely on estimated readings because you always forget to check and submit the real ones? When you haven’t watched TV for weeks, even though 999: What’s Your Emergency is back on and you love it? When wearing more than jeans and a jumper seems like a total waste of precious, precious time that could be spent replying to emails or talking about mortgages or chasing the printers about the wedding invites AGAIN? I’ve been away from the blog for two weeks and nothing monumental has really happened. 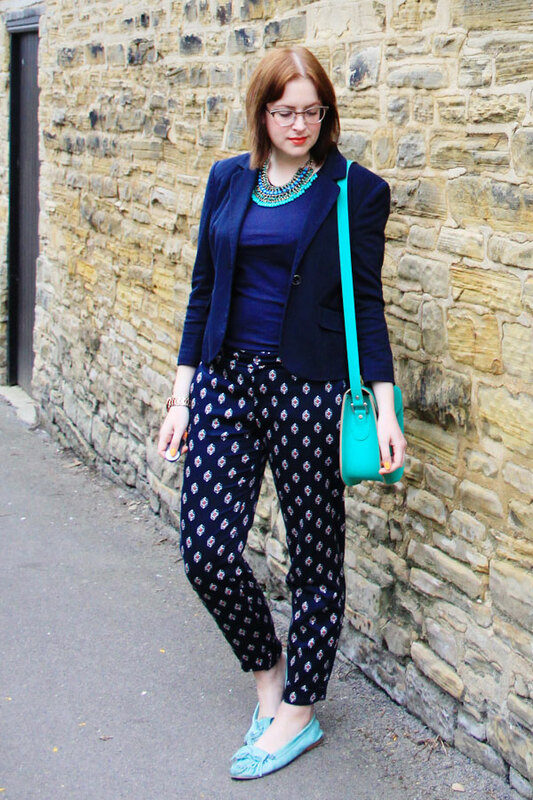 I went to see Beyoncé (amazing, was almost sick from screaming), I took on a few new clients (including Brit-Stitch, who sent me lots of lovely bags to photograph) and I bought these awesome trousers from Zara (plus a hot pink pair which are quite spectacular). I love your trousers-excited to see the pink versions! I remember at uni everyone always harped on about time management and I still haven’t got the grasp of it a year later! I really love your bag! I have one similar to the Cambridge Satchel Company bags in neon pink 🙂 I think bright bags are amazing for spring and summer. I love your outfit, you look amazing! I absolutely love this pants! Obsessed with the bag and necklace! Oh my god, seeing beyond is monumental! 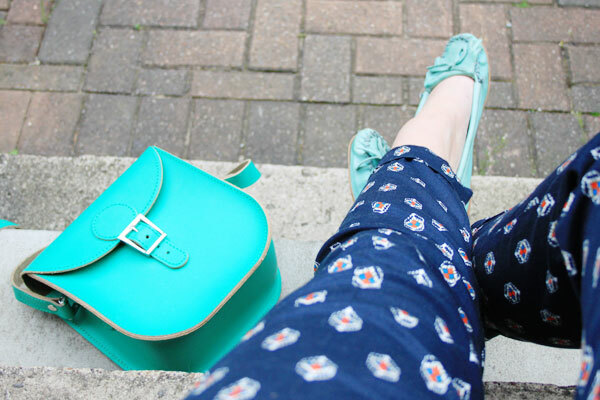 Love these trousers and bag, I desperately want a satchel. Great Outfit! I’m in love with that bag! Ooh, glad you’ve started working with Brit-stitch, we’ve started stocking them which I’m excited about, gthey are lovely and deserve the recognition! That’s so cool about Brit-Stitch. 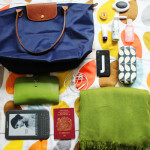 Lovely company, sent me a lovely bag to review. 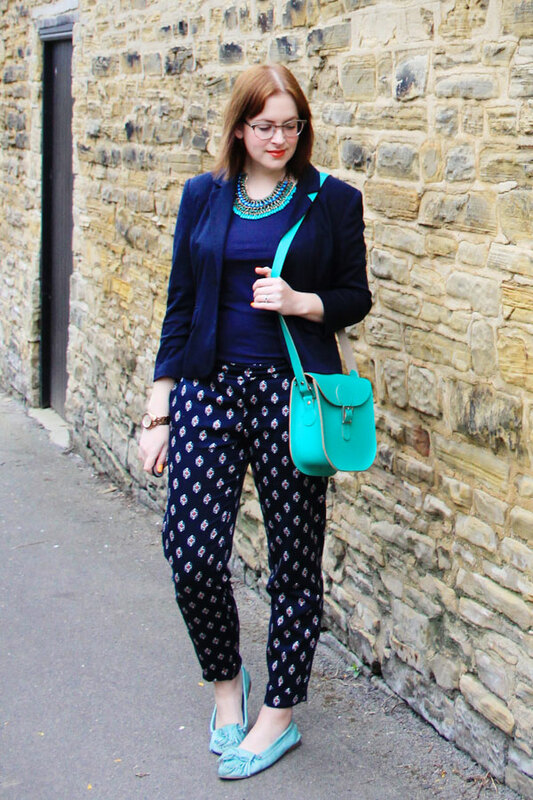 The necklace and bag colour pops are gorgeous! Zara seems to be getting better and better. 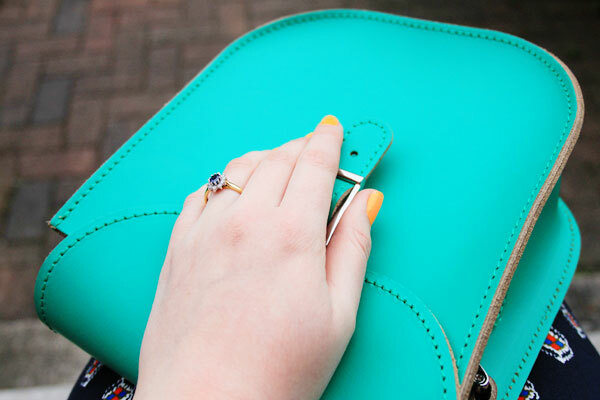 Love, love, love the shade of your bag! 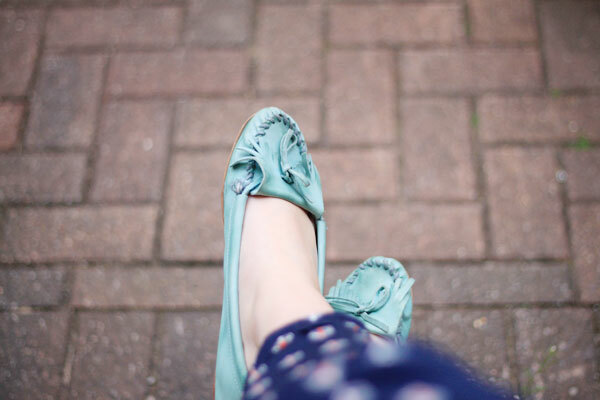 I have a mint green two tone one which I love, just wish it was summery enough to wear! I love this outfit, you always look so smart! Good luck with the juggling of life! 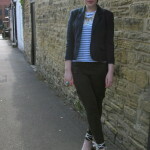 Navy and green is such a great combination for colour blocking. Absolutely love the colour of the bag! Ima going to have to get me some of those trousers! great outfit. i love the turquoise. 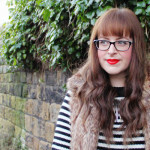 love your blog, it would be a pleasure if we could follow each other. I love the shoes and the bag. The colour combination is perfect and attractive.